Whether you're looking to upgrade your current website, or need a web developer to bring your designs to life, acuteFX Design offers a professional, low-cost development service buit to suit any project. 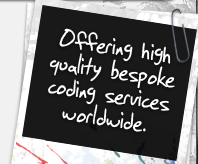 We code in a clear, formatted and commented fashion and to W3C Standards. Adding a Content Management System to your existing website is a great way of keeping your content up to date without ongoing charges from your web designer. Many websites today are built on a bespoke or open source CMS from the start, but the majority of older websites still rely on technical know-how to be updated which can be expensive for regularly changing websites. Our bepsoke systems will allow you to edit page's text and images, update your galleries or help manage your website's shop. acuteFX Design has over 6 years experience with turning Photoshop-designed templates into working websites. If you're a graphic designer and don't have the time or knowledge to build your templates into HTML and PHP, we can offer a 2-5 day turn around for designs of all sizes. Get in touch for a quote. No matter what you're looking to add or change on your website, acuteFX Design will have the solution! There's no job too big or too small. From adding an ecommerce system to an established website, to simply changing a website's colour or imagery; we're here to help.